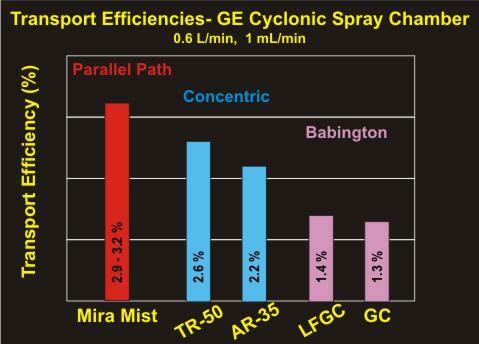 The Enhanced Parallel Path Method enables the liquid to interact with the gas stream in the central portion of the gas stream, imparting significantly more energy to the liquid than is possible with other nebulizers running at similar pressures. This causes the liquids to break up into smaller drops, which in turn allows more to pass through a chamber to the Torch of the ICP. Smaller drop sizes is one benefit, but without consistency, it does not help. The Enhanced Parallel Path method allows a smooth, continuous flow of the liquid into the gas stream, pretty well regardless of how much liquid is flowing. For smaller flows, the spout needs to be more exactly made, but the method is the same for tiny or great flows. Data from many tests show the benefits of the method. Following is a graph produced by Nathalie Le Corre, of JY Horiba, France. The test was run on a PEEK Mira Mist with 3% NaCl solution, for over 4 hours. 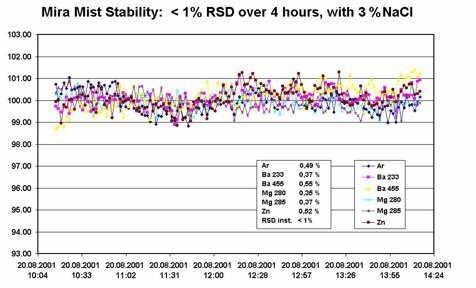 In this test, the %RSD variation is always less than 1%. In comparison, most nebulizers are glass concentrics, and they generally plug up as the salts precipitate in the gas orifice. Typically a glass nebulizer will be unable to run 3% salt for more than an hour without plugging up totally, and they always drift badly as the salts form. To run for 4 hours without any drift, nor any loss in sensitivity, and to be able to maintain less than 1% RSD is unheard of with other nebulizers. 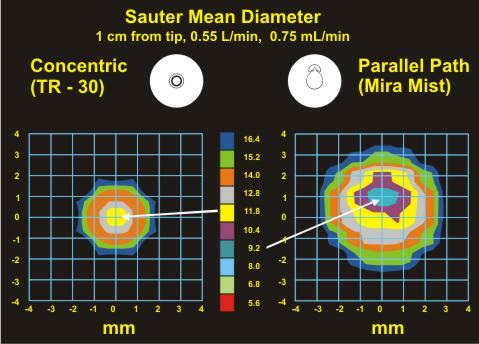 Droplet size is very important in analytical and many other applications. 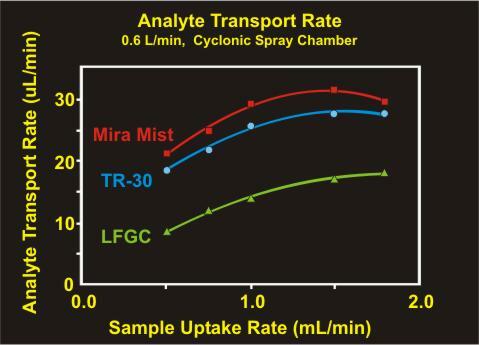 For ICP and ICP/MS instruments, the droplet size determines both how much travels to the torch, and also how quickly the droplets vaporize in the plasma. 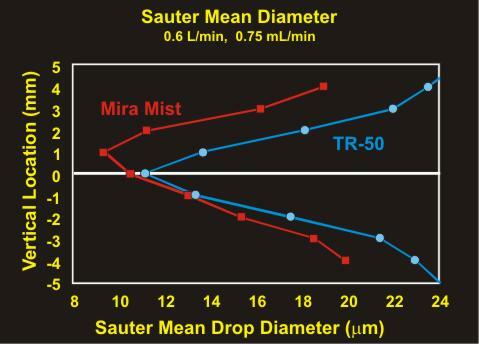 The stability and intensity of the results improves significantly as the drops vaporize more quickly. 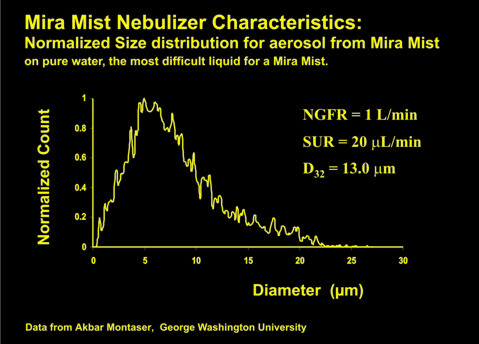 Data from work by Akbar Montaser, of George Washington University and by John Olesik, of Ohio State University show the smaller droplet sizes of the Mira Mist compared to a standard Glass Concentric nebulizer. 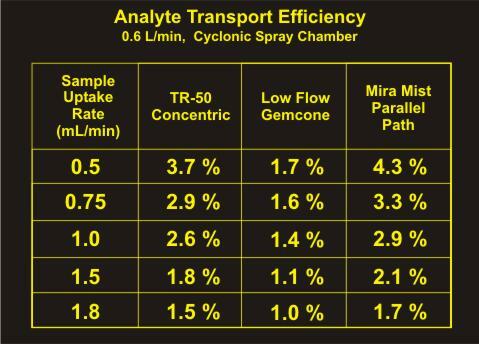 Note that although the % transport rates decrease as the sample flow increases, the actual total amounts delivered generally do increase. 4.3% of 0.5 ml is 21 ul; 3.3% of 0.75 ml is 25 ul; 2.9% of 1 ml is 29 ul; 2.1% of 1.5 ml is 31.5 ul; 1.7% of 1.8 ml is 30.5 microliters. Note also that between 1 ml and 2 ml, the amount delivered to the torch is almost CONSTANT. This also helps improve stability as even large variations in the sample flow have very small effects on the amount of sample delivered to the torch, so the system stability is very high if the sample flow rate is in the 1.2 - 1.8 ml/min range. by John Olesik, Ohio State University.